*Post contains affiliate links – should you make a purchase through the links – a FCS team member may receive a commission. 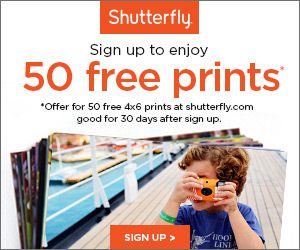 This is a Shutterfly savings you don’t want to miss! Want it for Valentine’s Day? You got it! Go take a peek around the Shutterfly site. Make a few photo books – maybe you’ve procrastinated getting those Christmas photos into one? Or would like to give one for a gift? Check out their calendars! I just received the first one I’ve ever made through Shutterfly and I am SO impressed! Terms: SWEETSALE Offer expires 2/10/2015 (11:59 P.M. PT) Offer is good for 50% off select qualifying 11×14, 12×12, 10×10, 8×11 or 8×8 hard cover photo books and additional standard pages, and 30% off other photo book cover types and accessories, cards & stationary, prints, calendars, photo gifts and home décor products through Shutterfly.com, our mobile-friendly site or Shutterfly apps (only certain products are available on the apps). Taxes, shipping and handling will apply. Not valid on personalized postage stamps, Hallmark inserts, prepaid plans, gift certificates, Videograms, cards sent using mailing services, prior purchases, or orders place for in-store pick up. Cannot be redeemed for cash or combined with other offers or credits. Not valid for resale.